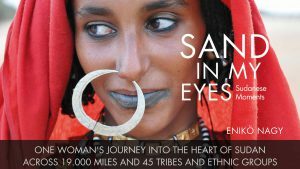 A travelling exhibition of photographs and texts from the SAND IN MY EYES picture book, accompanied by readings from the book and a short film is on tour through Germany, Austria, the Netherlands, Norway, Belgium, France, Italy, Spain, the USA and Sudan, with other potential locations being considered. The exhibition – a composition of photography and spoken word, arranged to mirror a day in Sudan across its different lifestyles – is a visual narrative of Sudan’s rich and varied cultural patterns, traditions, landscapes, and daily rituals. The images capture the mood of everyday moments and rare ceremonies, while poetry, folk tales, proverbs, legends, myths and anecdotes draw you into the social fabric.